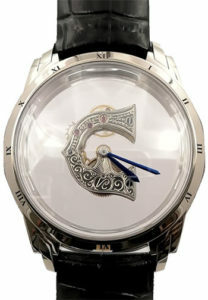 Vincent Calabrese is a self-taught, iconoclastic watchmaker. His motor is philosophical, his fuel is mechanical and is recognized world-wide as a “philosopher engineer”. His creations represent provocative challenges to mechanical traditions in general and to horological traditions in particular. Their number, their diversity and their have earned him international fame as one of the most fertile creative minds in the watch business. 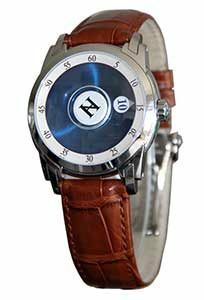 Vincent Calabrese’ watch making style enables him to make unique and personalized movements in any shape or form. He remains even today the only man who has created a hand-crafted watch movement in Platinum 950. Wandering hours and seconds with a turn-around logo. An optical effect allows a particular vision on the display. A case of 44mm in stainless steel, waterproof at 3 ATM. Designed and made by Vincent Calabrese in 18K white gold.